The Florida bar got an ethics inquiry from a local attorney. It asks whether it is permissible to instruct his or her client concerning two specific actions: 1) advising a client to remove posts, photos, videos, etc. from a personal social media account, and 2) advising a client to adjust the privacy settings to remove posts and accounts from public view. Both ask about pre-litigation situations, but with litigation certainly expected. 3) Telling your clients not to remove relevant information from the client’s social media pages is, for all intents and purposes, optional. Conceal evidence? Check. Destroy evidence? Check. Plausible deniability? Check mate. And for good measure, to support its conclusions, the drafters completely misrepresent other ethics opinions they cite for support. And a lot of commentators have too. 1) Attorneys expressly permitted to advise clients to destroy relevant evidence. Although the opinion does get off to the right start, briefly discussing attorney obligations to fair discovery and the (sort-of) laws governing spoliation and preservation, it quickly turns. The committee first declares that social media evidence is no different than regular evidence, citing several cases where parties were punished for spoliation. However, once it finishes discussing those cases, the committee strangely points out that they all involved pending litigation. That’s right, after discussing the duty to preserve evidence when litigation is expected, the opinion declares that pre-litigation evidence should be judged differently. At least as far as social media evidence is concerned. The Florida opinion expressly condones the deletion of social media posts the attorney believes are relevant to litigation. Sure, it suggests keeping some sort of record of them, but unlike EVERY OTHER ethics opinion on the issue, provides no guidance. Oh, and just so we’re clear, deleting a social media post destroys a LOT more evidence than the text in the post. Although I will discuss in more detail below, I have to address one point here: contrary to what the Florida Bar committee (and several commentators) have suggested – NO OTHER ETHICS OPINION ALLOWS THIS! 2) The Opinion encourages the active concealment of evidence. The second part of the opinion allows attorneys to encourage their clients to adjust their social media privacy settings. In anticipation of upcoming litigation. At first, this doesn’t seem too strange, until you remember that this opinion deals exclusively with pre-litigation conduct. To limit access to posts relevant to the upcoming litigation, that had originally been publicly available. The opinion claims to agree with the position adopted by the NYCLA, declaring that “a lawyer may advise a client to use the highest level of privacy setting (sic) on the client’s social media pages.” However, what the opinion fails to disclose is that the NYCLA opinion focused on advising a client about future posts. The NYCLA opinion goes to great lengths to state that using higher levels of privacy to conceal relevant evidence is a violation of the rules. Yet that’s exactly what this opinion promotes: concealing relevant evidence. First, the opinion deals exclusively with pre-litigation situations where the party has already retained an attorney. This is a case where the party anticipates litigation. Second, the opinion fails to address the current trend against allowing discovery of social media unless the requesting side can lay an adequate foundation about the evidence being requested. The NYCLA opinion dedicated pages to the issue. 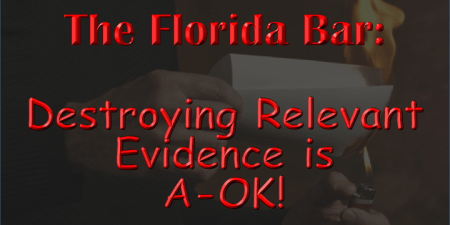 Does it seem like the Florida Bar opinion is deliberately misrepresenting the opinions it purportedly mirrors? 3) The opinion creates a ridiculous “plausible-deniability” loophole. I’ll take this one in two pieces. The first sentence essentially makes permissive, rather than mandatory, the duty to inform a client of the legal ramifications of social media. By comparison, the North Carolina opinion cited by the Florida Bar calls it mandatory – a simple matter of competent representation. Is the Florida Bar going easy on attorneys who aren’t tech-savvy, or providing less ethical attorneys a way to avoid addressing the issue? Look at the second sentence. “If a client specifically asks… regarding removal of information…” Or, in plain English – if your client tells you he wants to delete old Facebook posts. “[T]he lawyer’s advice must comply with Rule 4-3.4(a).” The rule the opinion was so kind to address at the top. So what does this mean? It means that if you get that call from your client, you have to tell them that you cannot obstruct access by destroying or concealing a document, and you cannot advise the client to do it either. You don’t have to encourage them not to do it. You’re not obligated to report any such destruction to the court. Hell, even your duties to avoid putting on evidence you know to be false only prevents you from allowing total lies from being spoken in court! It lets you tell your client – I’m not telling you to do it. Is that ethical? It’s never fun to be alone. It’s nice to know that others who were faced with the same decisions you address felt the same way. In a legal profession built mostly on common law principles, it’s actually essential. Which is why it isn’t surprising to see other ethics opinions cited liberally throughout the committee’s report. Opinions from New York, North Carolina, Pennsylvania and elsewhere are cited as examples of other jurisdictions who have ruled the same way. Florida isn’t cutting a path into uncharted waters, its following the lead of others who found the right path!